I love doing images with stipplegen, and getting good results depends on a bunch of parameters. Thus a good deal of experimentation is required. Fiddle with parameters, stipplegen for a while, judge results using inkscape with stroke equal to expected pen tip diameter, rinse, repeat. To me it seems like a fairly obvious inkscape bug, yet my searching in the bug reports at bugs.launchpad.net/inkscape nets me nothing relevant. I am asking whether the following seems like an inkscape bug, or have I got fog in my cockpit??? 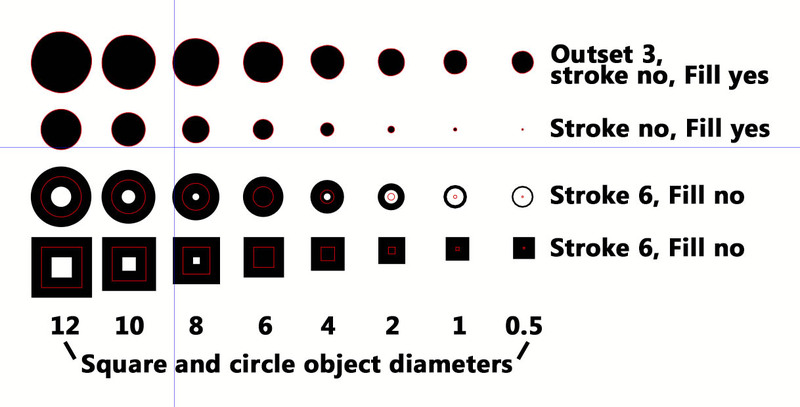 When stroking a circle, if the stroke width is greater than the circle diameter, then the inkscape rendering is hollowed out. This problem does not occur when stroking a square. See screenshot below. I have found, to my chagrin, that this problem causes me to misjudge the stipplegen parameters needed for a good print. I have found a workaround, but it adds hours to each iteration...I tell inkscape to not stroke, but to fill instead. Then I outset all the thousands of circles by an amount equal to the radius of my pen tip. Have I missed something obvious? is there a better workaround? should I file an inkscape bug report? ??? I can confirm this behavior, on both Inkscape 0.91 and 0.92. However, none of that really answers your fundamental issue here. The "right" solution is neither to worry about the rendering, nor to fill circles slowly, but to draw fast, filled circles within StippleGen. My solution to this is to replace each hollow circle with a single spiral, which can be plotted quite quickly. You'll also need Processing, from processing.org , as well as the ControlP5 library and Toxic Libs library. Wow!! Thanks for the very useful response. Tavmjong Bah's blog looks like a really good resource, thank you for pointing me toward it - dunno how I've missed it, I guess 'cause I had only looked at his tutorials. I certainly agree that your change to StippleGen is the "right" fix...realtime feedback for sure is ideal. I'm delighted that you have continued development of StippleGen. Woohoo!! Because you have gone to that much effort, I guess I will be "forced" to go to the much lesser effort of compiling it - and thus I thank you very much for the download pointers. Processing is wonderful; I imagine that you'll very much prefer being able to tweak the code directly, too. I haven't actually printed from the new version, but in just fooling around with it I think my workflow will be substantially smoother. 1. Use StippleGen2, adjusting # of dots, min.size, size range for best possible appearance. This is not the appearance which will be created when a finite-width pen plots the result, so "best appearance" is really a guess. Save .svg. 2. Import .svg into Inkscape. Do a long complicated process to account for pen width stroked onto my target object. Evaluate (guess) where the density or contrast of the image needs adjusting to give a better result. 3. Open image again in Photoshop, and apply the results of the evaluation. 4. Go back to number 1 above. 1. Use StippleGen2+. Select "filled circles on output" (woohoo!). Select "add pen width to display circles". In addition to the original three controls, also modify contrast by using the "dot gain" slider and the "scaling by area/diameter" toggle. Adjust til it looks good. This is the way it will look on the egg. 2. If results of 1 can't be made good, go to Photoshop with a very clear idea of where to make changes, then go to 1 again. * Cleaned up by removing test cases, etc. * In general, uses "///" to mark areas that need attention. * GUI controls to save and load control values for next time, using named saves. * Add gamma (aka "dot gain") control to modify dot size modulation i.e. local_contrast = f(brightness). * Increased vertical extent of GUI back to 800, for more accurate visualization of typical eggbot print area. (did this on the theory that v 2.0 reduced extent for typical screen sizes of the day, but that screen sizes have typically increased since then. * Decrease default # of stipples in order to make the interface more responsive when first loaded.